When you think of Corian, the first thought that probably comes to your mind is countertops. Hence, the idea of a Corian pool might sound a bit unusual as an application. 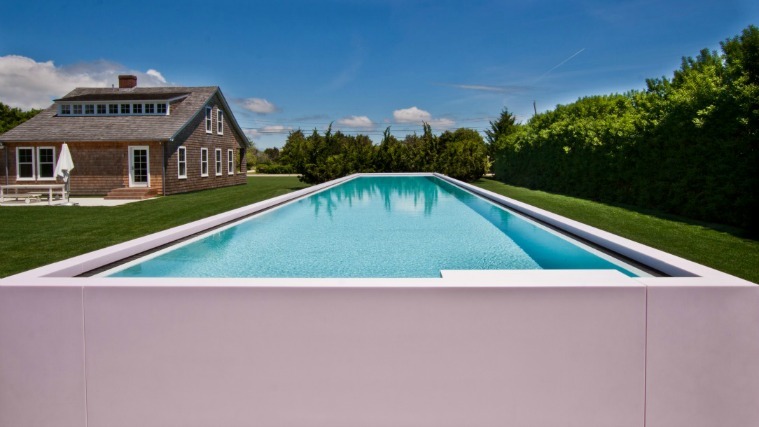 So when Roger Ferris & Partners from Westport, CT, approached us with the thought of cladding an outdoor pool with Corian, we were naturally very interested. The idea was to clad a 15 feet wide by 77 feet long concrete pool with Corian on all four sides, the top and the coping return. The first challenge was to figure out how the weather would affect the Corian. The pool was located in Long Island, NY, and experiences all four seasons of weather in full force, ranging from occasional 100 degree temperatures in the summer to frigid winter nights with temperatures often below zero and its fair share of windchill, being a stone’s throw from the Atlantic. Another challenge was creating a way to apply the Corian to the interior concrete pool monolith. We had to take into consideration the co-efficient of expansion/ contraction along with the weight of the panels. Also, how would Corian deal with the effects of UV exposure? Would the Corian fade? Would it be too hot to touch? Effects of the sun: There can be some fading similar to what you would find in other outdoor materials. The key is to pick a color that will fade minimally based on the manufacturer’s accelerated weathering tests. The color chosen for this project was Corian Strawberry Ice. Hot to touch: Have you ever touched playground equipment on a hot summer day?On sunny days, Corian gets warm much like other materials. Proper education to the end user is advised. Maintaining integrity of the panels: If not applied correctly, serious structural issues can result with the Corian. Without divulging proprietary information we can tell you the cladding is supported by a substructure that supports the weight and still allows the Corian to move as needed. The end result was that the job could be done. The work was completed in the spring of 2012.